"Gip" is the story of Henry "Gip" Gipson, a gravedigger by day and a hard drinking bluesman by night. 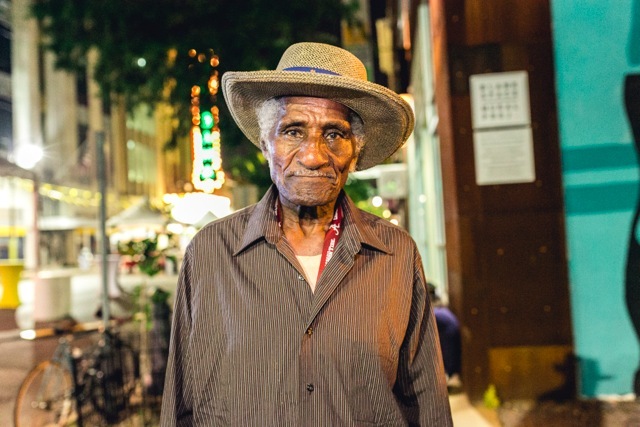 Henry "Gip" Gipson is a treasure in Alabama and his little juke joint, Gip's Place, in spite of its low-key, casual and almost hidden destination, is packed with people from around the globe every Saturday night. We had enjoyed the juke joint for years but as we learned more about Gip's history and life, we felt that it was a story that needed to be told. At "between 80 and 100 years old" Gip is still digging graves by day and operating his juke joint every weekend and has been doing so since 1952. When the city of Bessemer shut his juke joint down as we were shooting, we realized that we had a larger, more urgent responsibility as journalists/documentarians to capture a story that could be part of blues history. Documentary film has the potential to both educate and entertain, hopefully simultaneously, through good storytelling. Gip has an amazing narrative and beyond the music, the politics and the racial issues, it is the story of one man who fought the system the only way he knew how: by sharing the blues. In spite of the odds, Gip is still alive and hosting people in his backyard every Saturday night! He watches the fruits of his hard-won labor as people from all walks of life, rich, poor, black and white all come together to enjoy music. I hope that we captured a little taste of his juke joint for generations to come who might not ever be able to to experience the authenticity of a real juke or meet an extraordinary individual like Mr. Gip. It's rare to find an individual with a life history and mission that intercepted (or collided) so perfectly with such a tumultuous time in our country's history. For me, the story of Gip is a clear reminder that every ripple we make has repercussions and that our experiences (good and bad) create us, guide us and ultimately are the legacy we leave behind. Gip is an underdog, a missionary, an inextricable part of American music history. What is fascinating is that he is unaware of the profound impact he's had or how his contribution laid the foundation of American blues and ultimately rock and roll. Perhaps he experienced a bit of the magic as he watched this film for the first time in Birmingham, surrounded by hundreds of people who were there to support and thank him. When we began talking about this film in the winter of 2012, we discussed making a short film, primarily a biopic about Gip in order to preserve his story and his place in Alabama blues history. However, a few months into principal photography, Gip's Place was raided by the Bessemer Police and closed. We were shooting the night it happened and realized at that moment that our film just got bigger...and a lot more complicated. We knew we had to follow this story as it unfolded through city council meetings, lawyers, more police and some civil disobedience as Gip refused to keep his juke joint closed. The fact that all of this was happening as the city of Birmingham publicly celebrated the 50th anniversary of the civil rights movement just added a layer of context that we couldn't have written. We realized in our research that there were arguable only a handful of these juke joints left in America that are still owned and operated by the original proprietors. We needed to include them in this story in order to fully examine the important part they played and why it was so significant for Gip's to be shut down. And that meant some road trips. In Mississippi and interviewed Jimmy "Duck" Holmes of the Blue Front Cafe, Redd Paden of Red's Lounge and Willy Seaberry of Po' Monkeys and then headed to Louisiana to interview Teddy Johnson of Teddy's Juke Joint. We included blues historians as well as blues musicians like Bobby Rush and Debbie Bond. But the heart of the film was always Gip who is the oldest juke owner and one of the only ones who is himself a blues player. In the course of the four years we worked on this film, we became very close to Gip and that helped us flesh out his story and paint a more colorful picture of a very complex man. We often walked a fine line in order to tell both sides of the unfolding story which sometimes meant including things we knew might not be very popular with either side of the debate. Behind The Scenes - Producer Melanie Jeffcoat, Director Patrick Sheehan and Gip. The film has been really well received by audiences. We had an over-capacity crowd at the world premiere at the 2016 Sidewalk Film festival where it won Audience Choice Best Feature Documentary. It has screened at Indie Memphis Film Festival where it won Best Music Documentary. It has also screened at noncompetitive festivals like Cucalorus, Clarksdale Film Festival and is headed to Big Sky Documentary Festival on February 18th. We have a few more festivals that we will be announcing at the end of this month. I believe that a good number of people have made the pilgrimage to Gip's Place since seeing the film in order to experience it first hand. I think I was surprised at the feedback when Gip's Place was shut down and we were seeing letters from around the world. At that point, we realized that this film could have a much wider impact and that we better tell the story well. We hope to continue to build its potential audience by driving people to the film's Facebook page for upcoming announcements about festivals and screenings. We think this is such a great film for festivals which allow for so much communication with filmmakers and conversations about films. Our ultimate goal would be some sort of broadcast situation so that fans of Gip's Place can see the film around the world. I am receiving emails and messages daily from people wanting to see this film. We would like to gather a few more reviews of the film and continue conversations with distributors and buyers. Our hope is that the story of Gip inspires people toward the sort of open-hearted love and kindness that Gip shows to all people who come down his driveway. We also hope that his story will remind people of the very important part Alabama played in the creation and development of the blues and many legendary blues artists. How did these juke joints, created by African-Americans out of necessity during post-reconstruction and Jim Crow almost single-handedly create a genre of music and why is it so important to support and sustain these historically significant locations? I honestly never thought I would spend so many years in juke joints and I have learned that I cannot drink moonshine. We had a lot of help on this film which was essentially a labor of love. Musicians, artists, editors, crew, family and friends all pitched in to help us bring this story home and we are incredibly grateful for the support we received. Currently on the festival circuit with Gip and working on commercial projects and shorter films while developing our next long form documentary film. Patrick Sheehan (Director) Mr. Sheehan is a critically-acclaimed director and cinematographer and has worked on over 30 independent films and 70 documentaries. His films “Man in the Glass” and “Gip” have accumulated multiple festival awards. Ms. Jeffcoat is an award-winning director and producer of both narrative and documentary films. Her films “Open Secret”, “Man in the Glass” and “Gip” have had successful festival runs. Big Sky Documentary festival and then several festivals that will be announced by the end of the month.